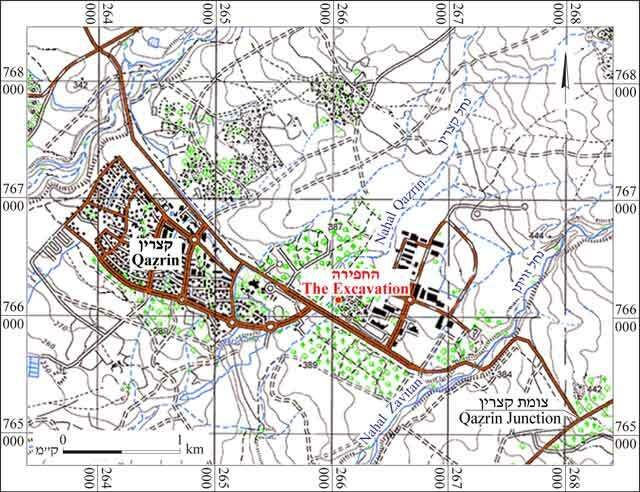 In 2011–2013, an archaeological excavation was conducted at the ancient site of Qazrin, near the entrance to Qazrin Park (Permit Nos. A-6338, A-6518, A-6777; map ref. 26606/76606), as part of the Golan Holam Program, an educational activity sponsored by the Golan Regional Council. The excavation, undertaken on behalf of the Israel Antiquities Authority and financed by the Golan Regional Council, was directed by O. Zingboym (field photography), with the assistance of Y. Ya‘aqobi (administration), R. Mishayev and M. Kahan (surveying and drafting), W. Atrash (scientific guidance), Sky View Company (aerial photography), the Galilee Archaeological Education Center (guidance), sixth grade pupils from the Golan Heights, H. Tahan-Rosen (pottery drawing) and D. Syon (numismatics). 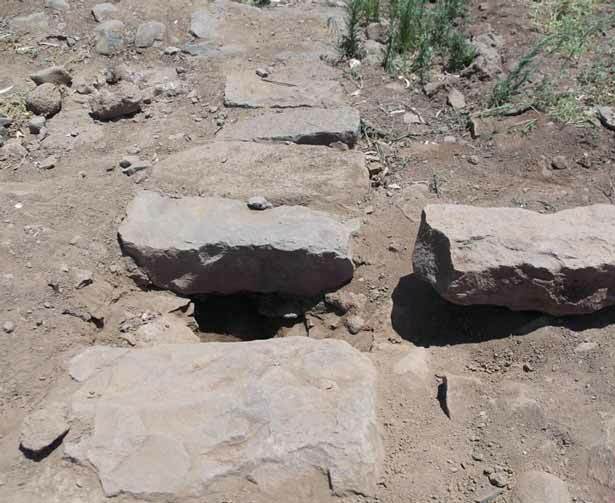 The excavation was conducted in a level area of Delwa basalt that slopes gently west toward Nahal Qazrin, which separates the ancient village from its cemetery (Fig. 1). The site was discovered following the Six Day War and was among the sites documented in the Emergency Survey that was conducted in the Golan. Several archaeological excavations and surveys were carried out there, which concentrated on exposing all the phases of the synagogue and several of the buildings in the adjacent village (Ma‘oz 1985; Ma‘oz and Killebrew 1988). Ten settlement strata, dating mainly to the Byzantine and Early Islamic periods (fifth–eighth centuries CE), were discerned. After a long period during which the size of the settlement was reduced, it flourished once again in the Mamluk period (thirteenth–fifteenth centuries CE). According to Ma‘oz (1992: Building B), the settlement reached its apex either in the sixth or the beginning of the seventh century CE, during the second phase of the synagogue. In 2005, a trial excavation was carried out at the site near the entrance to the JNF parking lot. Architectural remains dating to the third–fifth centuries CE were exposed, and Kefar Hananya type pottery was collected, indicating that the village was part of the array of settlements in the region during that period. The location of the buildings indicates that the settlement spread across an extensive area already at the beginning of the Byzantine period (fourth century CE) and not just in the fifth–sixth centuries CE, as the excavators of the site had previously postulated, and that it reached at least as far as the excavation area and possibly even farther south (Zingboym 2009). 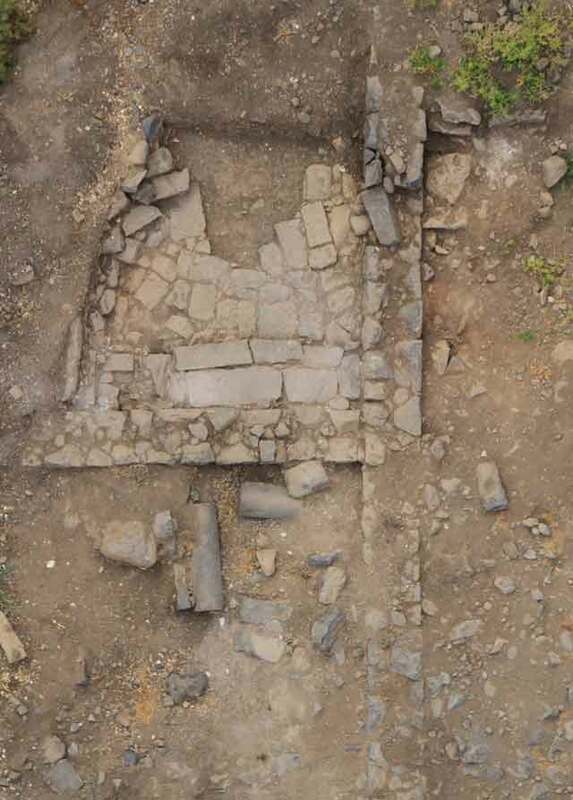 Thus, the scope of settlement at the site was considerably larger than what was exposed in the excavation, suggesting that its economic potential was greater than previously thought. 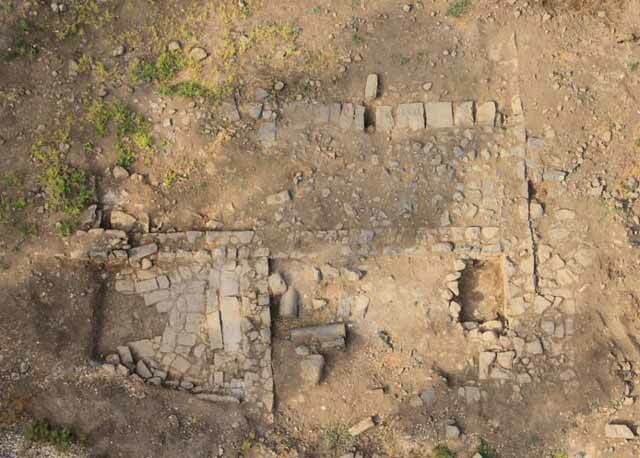 The current excavation was conducted along the western fringes of the village (100 sq m; Figs. 2, 3). The upper courses of a structure (c. 8 × 10 m) were exposed, consisting of two or three rooms built of roughly hewn basalt stones. Three walls (W1–W3) that formed two rooms (1, 2) were identified in the building, which was only partially exposed. The western corner (L108) of Room 1 was partially excavated, revealing a tamped-earthen floor. The room probably had columns that supported a wattle ceiling (see Hirschfeld 1995). 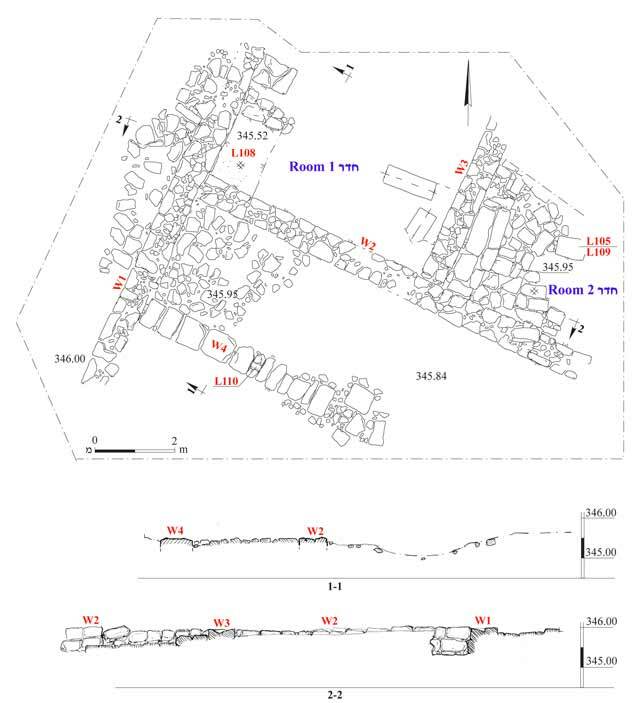 Room 2 was partially excavated (L105, L109; Figs. 4, 5), exposing a floor paved with flagstones, probably in secondary use. Several stones that might have been used for a shelf or were remains of an ancient wall were found beside W3. The top of a channel (W4) was exposed south of and parallel to W2. One of the channel’s covering stones was removed and a small probe was excavated below it that did not reach the bottom of the channel (L110; Fig. 6). 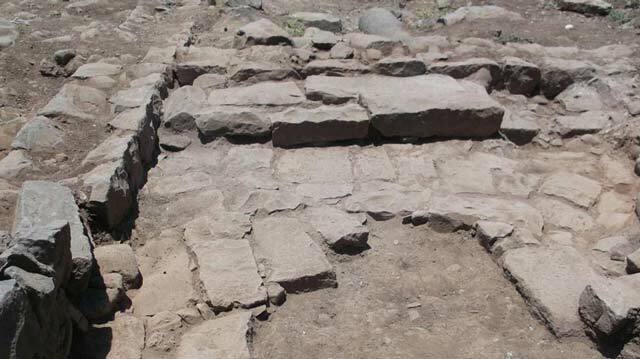 A pit containing two basalt column drums was also found. Although the pit was not excavated and the purpose of the drums remains unclear, it is obvious that they were not in situ. Pottery fragments dating from the Roman period (third–fourth centuries CE) through the Mamluk period (thirteenth–fourteenth centuries CE) were collected throughout the excavation area. These included a Kefar Hananya Type E1 bowl (Fig. 7:1), a Kefar Hananya Type C1 bowl (Fig. 7:2), a LRRW bowl (Fig. 7:3), a Kefar Hananya Type 4 cooking pot (Fig. 7:5), a cooking pot lid (Fig. 7:6), a jar (Fig. 7:7), a decorated sherd that might be Abbasid in date (Fig. 7:8) and a Mamluk krater (Fig. 7:4). It thus remains impossible to date the structure. The excavation results indicate that the fourth century CE settlement at the site reached this area. It was also apparent that the building was a rather large one. Future excavations might ascertain the relationship between the column drums found in the pit and the building. It was not possible to completely understand the plan of the building or the date of its construction because of the limited scope of the excavation. Hirschfeld Y. 1995. The Palestinian Dwelling in the Roman-Byzantine Period. Jerusalem. Ma‘oz Z.U. 1985. Qazrin. HA 86:2–5 (Hebrew). Ma‘oz Z.U. 1993. Qasrin. NEAEHL 4. Pp. 1219–1222. Ma’oz Z.U. and Killebrew A.E. 1988. Ancient Qasrin: Synagogue and Village. BA 51:5–19. Zingboym O. 2009. Qazrin. HA-ESI 121. 3. The excavation area: Room 1 (right) and Room 2 (left), aerial photograph. 4. Room 2, aerial photograph. 5. Room 2, looking west. 6. The channel, looking east.